Please meet Cate Whittle. We hope you enjoy learning more about her, and stay tuned throughout the day, when you'll meet the rest! Shhh ... don’t tell anyone, but I love dragons. What? You knew that? How did you? Um... okay, I love performing and remember all the school musicals I was in with more fondness than any other memories from my school days, even though I can’t sing! The only nickname I’ve ever had was given to me by a boy at my high school... something I never particularly appreciated. Otherwise, I answer to almost any diminutive for Catherine. Almost. Things that go bump in the night ... or, even more so, any ill that might befall the people I love and treasure, which I (typically) imagine whenever they are late arriving home. Character-driven, wild, organic, free flowing, and, I hope, funny. Daydreamer. Persistent. Imaginative. Life-long learner. Lucy Pevensie. She found the wardrobe. 7. If you could time travel, what year would you go to and why? Mmm. I’ve always loved learning about the past and I’d probably head back to Elizabethan England to see one of Shakespeare’s plays … I’d want to be very careful about the year I went, though, so I could avoid the plague! Write. Learn. Write some more. Don’t wait. I love the insightful humour and vast intelligence of Terry Pratchett, but I have a million writers whose voices I’ve allowed inside my head ... they have all piqued my imagination and influenced my writing, one way or another. Me... a long, long time ago. With help from my mum, who taught me to read and fall totally in love with stories at a very early age. Serendipity ... not only does it sound beautiful as it rolls off your tongue, but it holds so much optimism. Agghhh! One book? Such a difficult choice... would I choose The Lion, the Witch and the Wardrobe, which opened the door to a whole wonderful, fabulous, new world all those many years ago... or Magic Beach, with so many ‘doors’... or... sorry no, this question cannot be answered. Cate Whittle writes for children and YA. 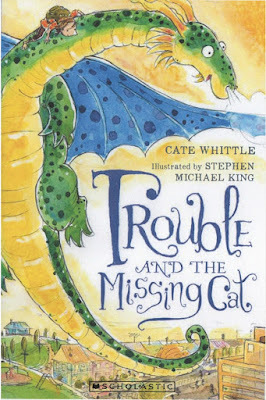 Her recent books, Trouble at Home and Trouble and the Missing Cat, are the first in a series about a troublesome dragon and his feisty young friend, Georgia, published by Omnibus Scholastic. Find out more at Cate’s website and facebook page.